If you follow me on facebook, you have seen the gallery already for February's WIPkits. Which is a good thing since I am lagging behind in posting my projects on my own blog. not for lack of nothing else to do, mind you. I gave up bon-bons and soap operas years ago. It felt as if it had been a long time since I did a traditional scrap project. Felt as though I was a little rusty. But when you look at that little boy's photo album...it is more than obvious that I have fallen off telling him his story. ProjectLife has taken over some of that. But I did enjoy the creative process of telling the little mr. the story of his day out on the snowy hill. love that blue and grey together. And don't even get me started on the chevron pattern. 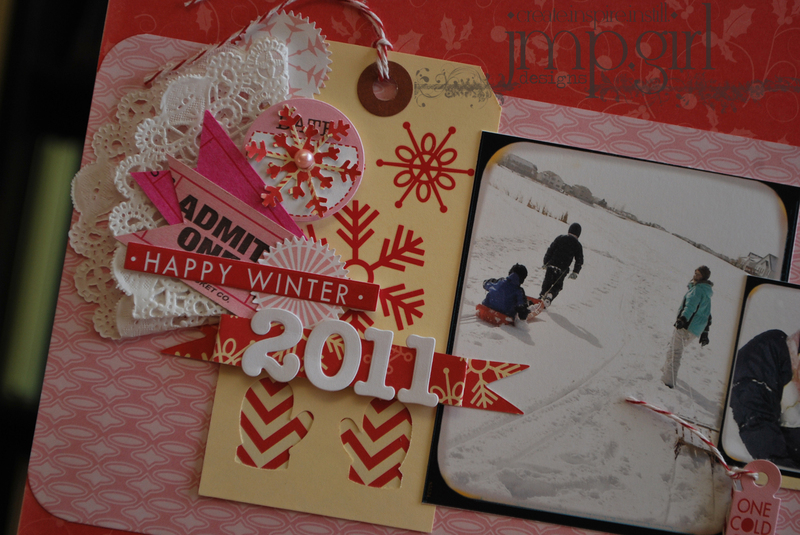 We have had such little snow the past few years, Since the Jan WIPkit was full of winter wonder goodies, I was so glad I had good stories to tell. These girls and their neighbor friends were so thankful for Christmas break-time snow storm. The golf course out back was a perfect wonder land of deep snow to fill their love of this winter time activity. So happy they had these days like this just before Christmas. Perfect memories. Birthday pics of the eight year old. Cannot believe this one is eight. And knows how to pose. Love it all...even though at times it can exhaust. I added journaling to this layout right on top of the solid pink cardstock. The 'white' space was begging for it, plus I had something I wanted to share with this birthday girl. Be back later in the week with a tutorial on how to construct the pattern paper flowers. Holy Crow, your pages are just gorgeous, Jamie! I can't help it! I just adore every little thing that you do!! Love your use of doilies..I have a weakness for them too. 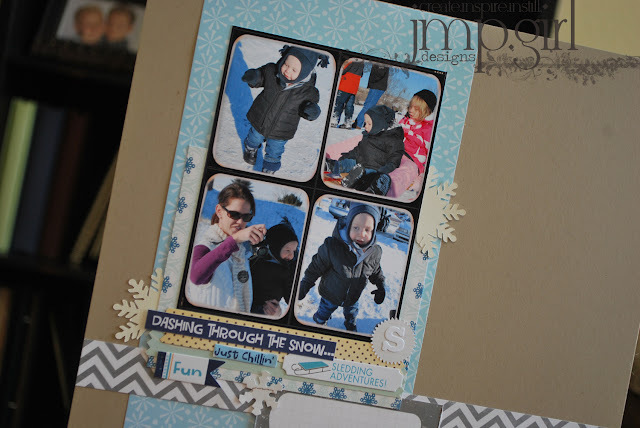 Lovely snow pages! Love the pink and red together! 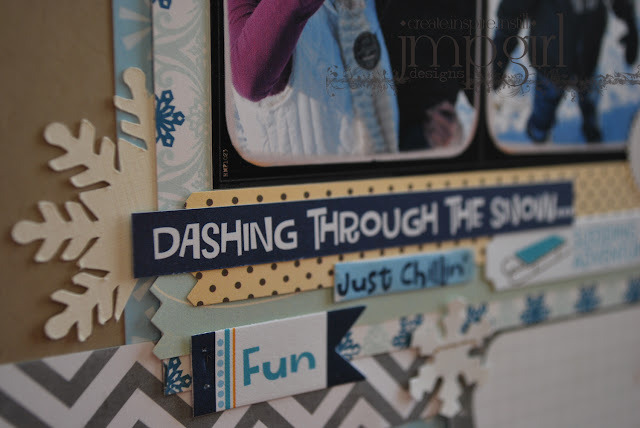 I am very happy to see some of scrapbooking pages here this morning :) LOVE them!!!! Each have fantastic details with very clean lines. Beautiful colors too! Hi Jamie, what great pages. Love them, especially the "Sweet Girl" Page:-) I have to lift it soon!